Cheap coin supplies are in high demand by collectors who want to take care of their coins but don’t have much… ahem… “coin” to spare (cue the joke punchline drum shot… ba dum sssssst). But, in all seriousness (OK, I’m not really going to get too serious – this is a blog post about a fun hobby after all), buying coin supplies can be a very expensive burden on coin collectors who have only a few bucks or so each week to spend on their passion. So how can coin collectors on a budget find cheap coin supplies that they can trust? Thankfully, there are plenty of great coin collecting supplies that can be bought even on a tight budget. Among cheap coin supplies, there’s probably none more classic than the blue Whitman coin folders that coin collectors have been using since the middle of the 20th century. While many companies manufacture coin folders, Whitman’s are among the most popular made today. These coin folders have a navy blue cover and light blue interior, and usually consist of 3 cardboard panels with holes cut out that are just large enough to accommodate coins of certain sizes. Most Whitman coin folders can be bought new for under $5, though some coin dealers offer used coin folders for $1 or less each. For those who want a fancy little presentation case for their coins, there are Marcus Snap Lock coin cases. Marcus Snap Lock coin cases are 2” x 3” in diameter and are clear, flat clamshell cases that have a cardboard insert. The insert is often illustrated with a picture that is relevant to the coin, or coins, that the case is meant to display, though some inserts are velvet-lined. Most Snap Lock coin displays cost under $1.50 each. 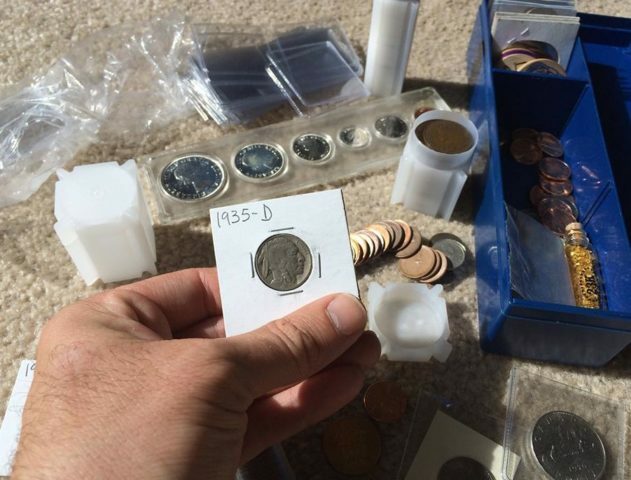 If you’ve ever been to a coin dealer’s shop, you have probably noticed that most of the coins there are stapled into square cardboard holders that have a single clear, circular window in the middle. These coin holders are called 2 by 2s, and the name of these cheap coin supplies simply refers to the dimensional size of the cardboard holder. However, many “2 by 2s” come in other dimensions, including 1-1/2” x 1-1/2” for smaller coins (such as one-cent coins and nickels) and 2-1/2” x 2-1/2” sizes for large coins, like American Silver Eagles and foreign crowns. 2 x 2s are available with windows that are perfectly sized for coins of various dimensions, ranging from the dime on up through the American Silver Eagle. 2 x 2s are usually sold in packs of 25, 50, or 100, though some coin dealers sell them individually. Normally, a 100-pack of 2 x 2s sell for around $7. If you buy them individually, expect to pay about 10 cents each. There are many variations of the clear plastic coin flip, which is a pliable plastic coin holder that has 2 square, clear pouches – one to hold a coin, the other to hold a paper insert that identifies the contained coin. While there are many types of coin flips available, one of the safest kinds is the SaFlip coin flip, which does not contain any polyvinylchloride (PVC) or other agents that are known to harm coins. Most SaFlip coin flips are about 2” by 2” square and accommodate coins of all dimensions up through the silver dollar. There are 2-1/2” by 2-1/2” coin flips for American Silver Eagles and other large-size coins. A pack of 50 SaFlip coin flips costs around $10. Have lots of duplicates that you either want to sell or hang onto for the future? Maybe a bunch of loose coins that you don’t really want to display right now but still want to keep safe? Coin tubes may be just what you’re looking for! Coin tubes are rigid, plastic roll containers that contain large quantities of coins. These clear, polystyrene tubes have a screw-on cap and are ideal for safe, long-term storage of your coins. Coin tubes contain as many coins for each respective denomination, as you might find in a roll of coins from the bank. H.E. Harris is one of the most popular coin roll manufacturers, and sells round- or square-profile coin tubes. A box of 100 sells for around $40, though most coin dealers sell them separately for about 50 cents apiece.